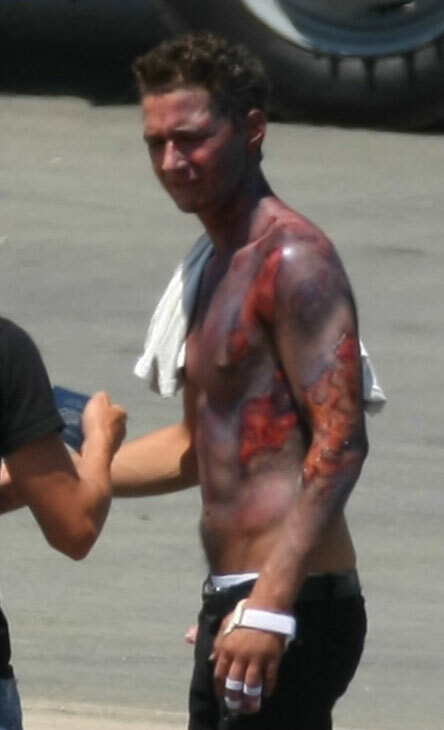 It’s been reported that actor Shia LaBeouf is now back on the set of the Transformers sequel. If the picture above is any indication, LaBeouf’s Sam Witwicky character is in for a world of hurt. There are talks that the injury he sustained in his car accident more than a month ago will be written into the movie so that the production of Transformers 2: Revenge of the Fallen, will not get delayed. hey shia i think in your you are the best actor im a big fan !!!!!!!!!!!!!!!!!!!!!!!!!!!!!!!!!!!!!!!!!!!!!!!!!!!!!!!!!!!!!!!!!!!!!!!!!!!!!!!!!!!!!!!!!!!!!!!!!!!!!!!!!!!!!!!!!!!!!!!!!!!!!!!!!!!!!!!!!!!!!!!!!!!!!!!!!!!!!!!!!!!!!!!!!!!! and i love disturbia and transformers are the best u mad so far im 13 !!!!!!!!!!!!!!!!!!!!!!!!!!!!!!!!!!!!!!!!!!!!!!!!!!!!!!!!!!!!!!!!!!!!!!!!!!!!!!!!!!!!!!!!!!!!!!!!!!!!!!!!!!!!!!!!!!!!!!!!!!!!!!!!!!!!!!!!!!!!!!!!!!!!!!!!!!!!!!!!!!!!!!!!!!!!!!!!!!!!!!!!!!! !